Anyone know why this is occurring? Synergy crashes on both my Mac Pro and iMac 5K at start-up. Any suggestions Nick or Paul or anyone? So I deleted all files Synergy using AppClean and reinstalled beta 3. Synergy launches, but having issue's connecting to the iMac. Not a problem with the Mac Pro. I don't know if this tells you anything. 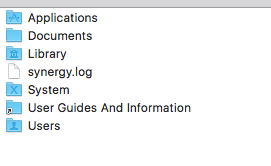 Also, is it normal to have to Synergy logs appear, one on my main drive and two, in the Applications folder? The log file appearing in that directory has already been fixed and will be in the next release. Sorry about that. On the iMac, the IP address is 192.168.0.2. This is a wried connection between the iMac and Mac Pro. I use an application called: Vienna Ensemble Pro. Connecting via wire enables me to use VEPro on my Mac Pro. On My Mac Pro, there are 2 Ethernet ports. One is use for the net (192.168.0.10) and the other port, 192.168.0.1 is the wired connection coming from the iMac. I have also tried to check the older thread you started and I saw this. Looking in to this, I guess that's because it is trying to find the other machine on the Wi-Fi network instead of the wired network. This should be easier once the planned feature of manually choosing which network interface to connect is supported. Alternatively, you can make sure to disable Wi-Fi first and open Synergy. If you really need to have Wi-Fi connection(which I doubt since you are connected wired), you can try to turn it back on after successful connection and check if Synergy is not affected. Hey Paul, here's what I see on the Mac Pro. I really don't need to use the WiFi on the iMac. I only use it to update the system or software. 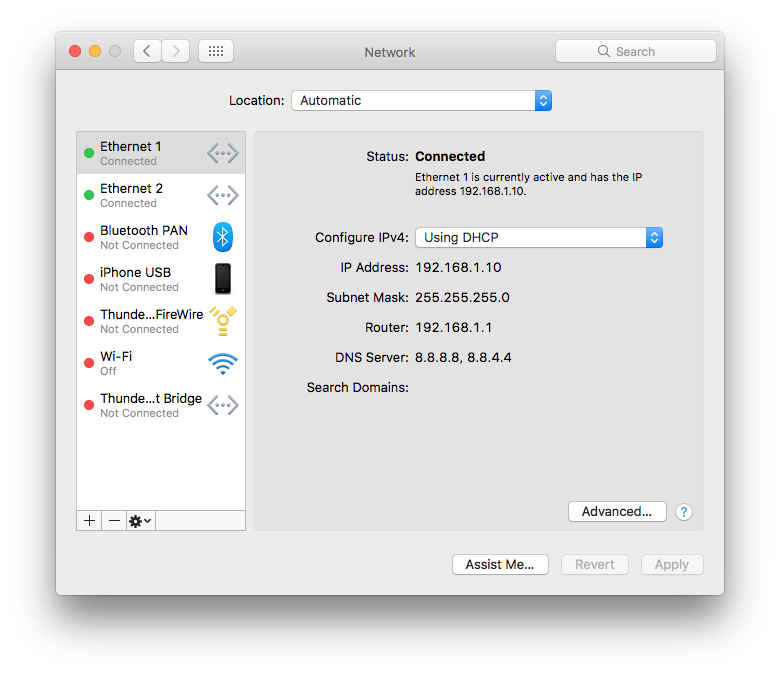 I noticed that when I need to connect both computers, I need to have the iMac's WiFi enabled. Once both computers are talking too each other, in other words, I can drag the cursor from one screen to another, I can then turn the WiFi off on the iMac and everything still works. So I'm assuming at first launch, Synergy has a difficult time connecting via wire, but once connected, I guess either WiFi or wire will work. I just find wire more reliable than WiFi. Thanks! That's great to hear! And I guess the answer is shown on the 2nd screenshot you posted. It shows their that it was configured manually. Also, it shows that the "Router(default gateway )" and the DNS server has no values. When you try to search for machines or even websites, your computer actually asks direction from the DNS server. It's like the yellow pages for the old school guys unlike today that Mr. Google exists. Since DNS server is not existing, it won't know how to connect to the other machine. Now when you turned the Wi-Fi on, it sees the other machine in the Wi-Fi network and managed to get the local domain name of it and connects. When you turn the Wi-Fi off, it still remembers the domain name used by that machine and tries to find it in the network. This time it queried it from the 192.168.1.1 server and used the local domain name, that's why it still worked. I guess the upcoming manual network interface selection feature should help you better. This is a proof that even having a manual method of connecting sounds less seamless, it really is more seamless for some kind of network setups. Same as what your setup is. Anyways, let me thank you for updating us on this @Dean Landon. Have a great day! Since DNS server is not existing, it won't know how to connect to the other machine. @Paul Suarez The problem has nothing to do with DNS. Synergy simply connects through the first working network connection that it finds. It's pure coincidence that it didn't use the manually configured ethernet connection. It doesn't matter if there is DNS configured or not. As long as one of your connections has valid DNS configured, the cloud discovery feature will work. I guess the upcoming manual network interface selection feature should help you better. I think we'll be forced into doing this sadly, but it'll be a hidden/advanced setting for sure. Going forward, we'll probably try implementing a feature to test all available connections simultaneously, choosing the best one automatically. This would be much more intuitive than requiring user intervention. Thanks for your replies. Nick, you said: "Going forward, we'll probably try implementing a feature to test all available connections simultaneously, choosing the best one automatically. 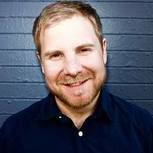 This would be much more intuitive than requiring user intervention." I think this is a great idea. Doing this manually can be a PITA. Paul did bring up a good point though. Why is my iMac not connection when the WiFI on the iMac is off? Shouldn't it be able to connect automatically with the iMac connected via wire to the Mac Pro? Am I missing something? Thanks! Hey guys, is this normal? Thanks! 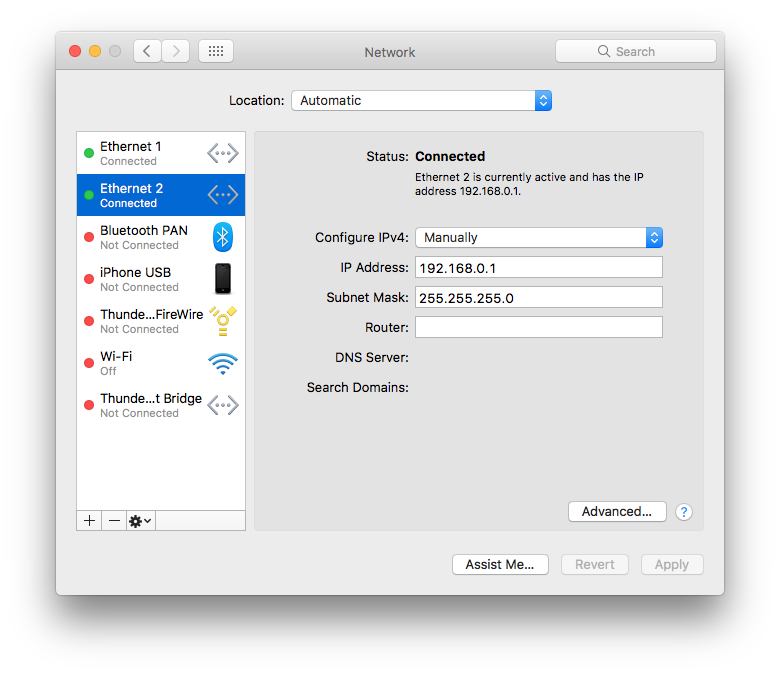 Why is my iMac not connection when the WiFI on the iMac is off? Shouldn't it be able to connect automatically with the iMac connected via wire to the Mac Pro? It should be able to connect automatically, but right now it only does this when you restart the config UI (down to lack of a feature). That's actually a bug, it shouldn't be there. We'll be fixing that soon. Thanks for the info, Nick. I noticed with beta 3 that after I boot up the Mac Pro and iMac, Synergy crashes when I try to start it up. I double click to start Synergy, it appears for a second and then disappears. Is there anything I can do about that? At the moment, the only way to get it up and running again is if I delete all files related to Synergy and reinstall it. @Andrew Nelless Are there any crash reports for this?